TOKYO -- Suzuki Motor Corp. today said that it plans to end its capital and business alliance with Volkswagen. Suzuki said it will ask VW to sell the Japanese carmaker's shares, saying the alliance has become negative for its management independence. The announcement came after VW said on Sunday that Suzuki's decision to source diesel engines from Fiat S.p.A. infringed on the terms of their partnership. 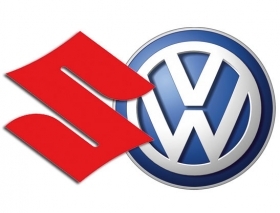 VW owns 19.9 percent of Suzuki while Suzuki owns 1.49 percent of VW. Suzuki said it plans to sell its VW shares if the German company agrees to the arrangement. Suzuki decided to end its capital alliance with Volkswagen at an unscheduled board meeting today, the company said in a statement sent to the Tokyo Stock Exchange. VW spokesman Michael Brendel said the German automaker has no intention of selling or reducing its stake in Suzuki. He said Suzuki has broken the partnership agreement between the two carmakers by deciding to buy engines from Fiat. Volkswagen and Suzuki have been at odds since VW said in its annual report published in March that it could "significantly influence financial and operating policy decisions" at Suzuki, describing the Japanese company as an "associate." Osamu Suzuki, the Japanese carmaker's chairman, said in an interview on Aug. 10 that the company "sees no reason why Volkswagen would be upset" about Suzuki expanding its purchase of engines from Fiat. Suzuki formed an alliance with Fiat to make diesel engines in Asia in 2005. In June this year, it expanded the agreement to buy engines from Fiat in Hungary. The public feud has brought to a halt VW's efforts to form an operational alliance. The partnership was meant to combine Suzuki's leading position in India, Asia's second-fastest growing major economy, with Volkswagen's global reach as the world's third-biggest carmaker. When the VW-Suzuki deal was signed in December 2009, the companies said they intended to cooperate on technology, including hybrids and electric cars, and expansion in emerging markets. Almost two years later, no joint projects have begun. VW, which forecasts deliveries will rise 5 percent this year after selling 7.2 million vehicles in 2010, aims to surpass Toyota Motor Corp. and General Motors Co. as the world's largest carmaker by 2018 and is targeting India as an expanding market to boost sales. Suzuki, which sold 2.64 million cars in its last fiscal year, delivered 1.13 million of those vehicles in India. VW sold 53,300 cars in the country in 2010. Volkswagen still views Suzuki as "an attractive investment," Christine Ritz, VW's investor relations chief, said on Sunday. VW is of the opinion that Suzuki has rolled back the partnership to square one by keeping its German ally in the dark about the Fiat plans and its intentions to seek alliances with rivals, a person familiar with VW's thinking said last month. VW Chief Financial Officer Hans Dieter Poetsch said on a July 28 conference call that the partnership is under "review." That review is still ongoing, VW said. A successful relationship depends on an understanding that the two are equal partners, two Suzuki executives, who declined to be publicly identified discussing the matter, said last month. The company aims to clarify what direction it wants to take with the partnership by October, one of the executives said. "Volkswagen keeps talking to the media, but not to us directly," Chairman Suzuki said in the Aug. 10 interview. Osamu Suzuki wrote in a July newspaper column in the Nikkei that he hasn't found any VW technologies he'd like to adopt following an extensive review of what they have to offer. Suzuki also said in July the automaker was open to forming alliances with others. Volkswagen CEO Martin Winterkorn said in May the automaker planned to target the small-car segment in India as a potential joint project with Suzuki, as well as parts procurement and development of alternative-drive technologies. While Suzuki has a dominant position in India, where its Maruti Suzuki India Ltd. unit is the market leader, increasing competition means holding onto the top spot will become harder. VW's global reach and product portfolio, with more than 60 models at the namesake brand alone, could help. Maruti Suzuki will sell 36 percent of the 3.07 million vehicles delivered in India in 2011, IHS Automotive estimates. Overall sales in the market will climb 76 percent to 5.41 million in 2016, with Maruti Suzuki nabbing 25 percent, according to IHS forecasts.